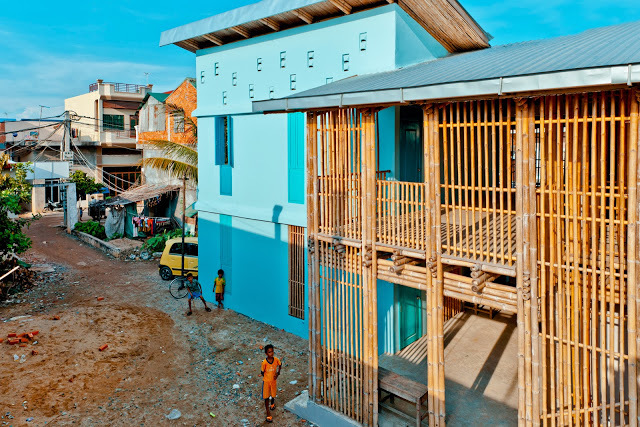 We are excited to announce that Building Trust international are hosting a two week long sustainable build workshop in Phnom Penh during February. I am writing to ask as to whether you would be interested in taking part. We are offering a hands on participatory workshop where you will gain experience in sustainable building techniques and understand more about humanitarian design while supporting a worthwhile community project that will have a huge benefit to the local community and positive effect on the local environment. You will gain an insight into a number of building techniques and architectural styles including some of those listed below. What will you will learn? Bamboo anatomy and species familiarisation. The youth center is operated by Cambodian organizations Cambodian Volunteers for Society (CVS) and Khmer Kampuchea Krom for Human Rights and Development Association (KKKHRDA) and was designed and built by Komitu Architects. Donation: We have daily and weekly rates for our educational workshop, please get in touch to find out more. *Please note all funds raised through the workshop will go towards buying materials to make the projects happen. The running and organisational costs have been covered.We look forward to discussing further as to how you can use your skills to help communities very much in need in Cambodia. Please do not hesitate to contact us if you have any questions or queries. Our volunteer workshops offer you the chance to meet some fantastic people, learn new skills, visit fascinating locations and contribute to the empowerment of local communities and worthwhile causes. We look forward to hearing from you!